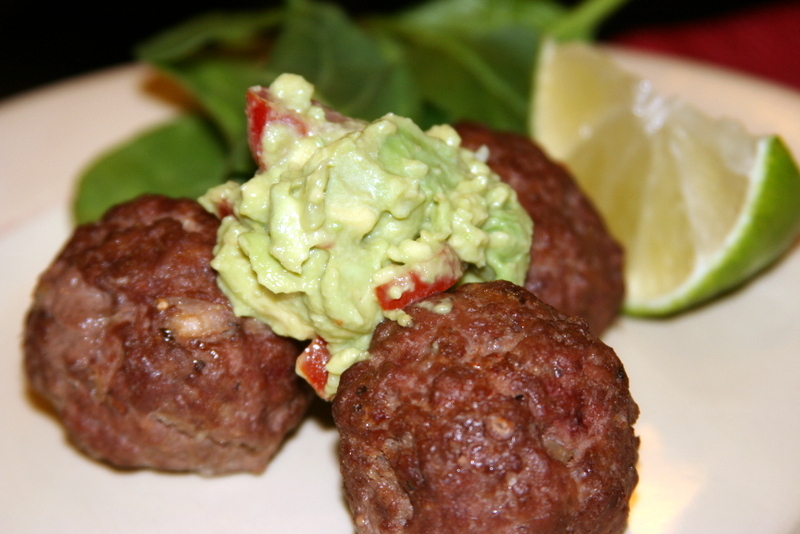 Meatballs are quite seriously one of the best Paleo snacks around. You can make a giant batch, eat some for dinner, save a few for the week, and freeze the rest for emergency moments. You can also make them taste like just about anything, which is really important if you love variety and traveling the globe through your food. I’m from California and one of the things that I miss deeply about living there is the ability to wake up and, on any day, have a craving for a particular nationality’s cuisine that I can satisfy virtually immediately – either by going to an amazing restaurant or by readily finding the ingredients and making it at home. I love living in Colorado, but California (I’ve lived up and down the coast) is truly a foodie’s heaven. But…since I don’t live in CA anymore, I need to feed my heart and soul with flavors that transport me. Otherwise, I get bored. If you are new to Paleo or you are trying to reinvigorate your Paleo eating, then I suggest you make a batch of these. They’re delicious, easy, and you can do a bunch of different things with them. We ate them just like in the picture with a dollop of quick guacamole and a handful of veggies that we grabbed because we were in a hurry, but you could slice them and have them in a Paleo tortilla or wrap them in lettuce and add salsa or serve them with a Mexican inspired cauliflower rice. And you know what else? You can just eat them! Pre-workout, post-workout, protein-filled snack…whatever you need! Seriously, meatballs save the day. You could probably add an extra minced chipotle pepper if you like it spicy. I also had to feed a 10 year old so I didn’t want to go overboard. As I think about these, I’m wishing I had some Carrot-Jicama Chipotle Slaw handy because they would make an excellent lunch paired together. Whatever you do with them, I hope you enjoy it! 1 shallot, finely chopped, about 3 Tbsp. Place meat and all the seasonings in a large bowl. Mix everything together gently but completely. Form meatballs that are about 2 oz., or small golf ball sized, and place them on a cookie sheet. Bake for about 15 minutes, switching oven shelves about half way through. Check for doneness and cook another 3-5 minutes if not done to your liking. Let rest for about 10 minutes and then enjoy! Notes: These keep well in the refrigerator or freezer for future snacks and meals, so make a bunch! The holidays can sometimes get the best of us with the various parties and social engagements, busy schedules, shopping, and treats. Lots and lots of treats. Now that I’ve been eating Paleo for a few years, I find that even when I go off-roading (and I admit, sometimes it’s rather significant off-roading), my body really wants to come back to this way of eating because I feel so much better inside and out. I think it’s pretty clear that I have a love affair with vegetables. I don’t just eat them because they’re good for me, I truly love them and crave them. If I go very long (like a meal or two) without having enough of them, my body starts to send some clear signals that it’s time for me to load up. This time last year, in fact, I flew with my son to visit some family and friends in California for Christmas and after a day of traveling, all I wanted was a giant pile of vegetables. We arrived at my friend’s house and while she offered me anything I wanted (cheese comes to mind), what I ended up doing was grabbing a bag of baby bell peppers and sitting on the couch and chatting while I took down a ridiculous amount of peppers as if they were candy. So that’s how this stir-fry was born. There were a few too many meals that we grabbed on the go and one or two too many cookies that were eaten. My brain thought everything was great and was having fun with all the sugar. Meanwhile, my body was begging for a vitamin. The snow peas were beautiful at the store and I always have a knob of ginger in my freezer. Quickly this dish took shape. It would have been delicious on cauliflower rice or over some finely shredded cabbage, and if you do rice, that would have been great too. This little stir-fry was just what I needed to get back on track. 1) Melt 2 tsp. coconut oil over medium-high heat in a large skillet. Add the carrot and sauté for about 2 minutes, then add the snow peas with any remaining water clinging to them and the scallion whites and cook for about 4 minutes until just tender. If the pan seems too dry, add a tablespoon or two of water. Remove to a plate. 2) In a small bowl, combine coconut aminos, rice vinegar, and pepper flakes. Set aside. 3) Melt remaining tsp. of coconut oil in the pan and add the meat, stirring quickly until barely cooked through, about 3 minutes. Add the ginger, garlic, reserved veggies, and scallion tops and stir until fragrant. 4) Add the sauce and cook until it reduces very slightly, about 1 minute. 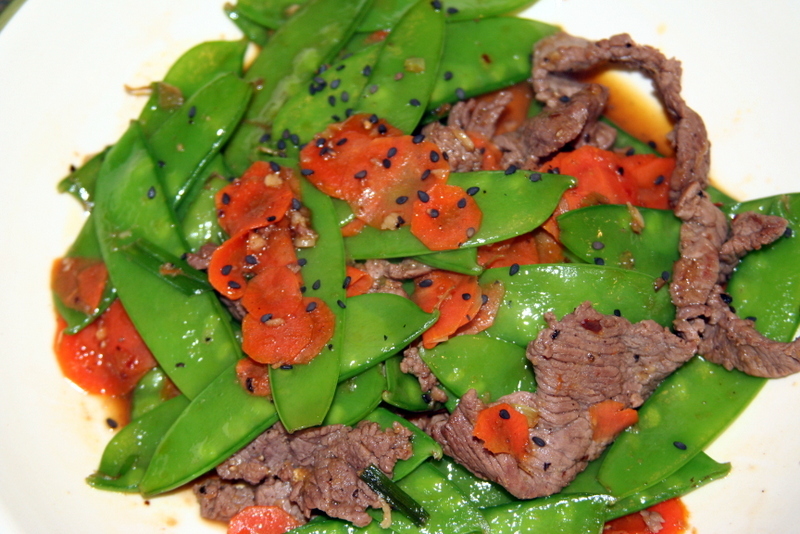 Adjust seasoning, adding any salt and pepper or sesame seeds to taste, and serve. Finally! A meat dish from me. I laugh a little bit every time I go to post a recipe and find myself wanting to share yet another veggie side dish that I’ve prepared. Maybe with the arrival of winter there will be more opportunities for me to share protein dishes because the colder weather inspires me to cook indoors more frequently. Summertime has me grilling just about everything and that keeps things simple, but now there’s a chance for a little more creativity in the kitchen when it comes to the main event. 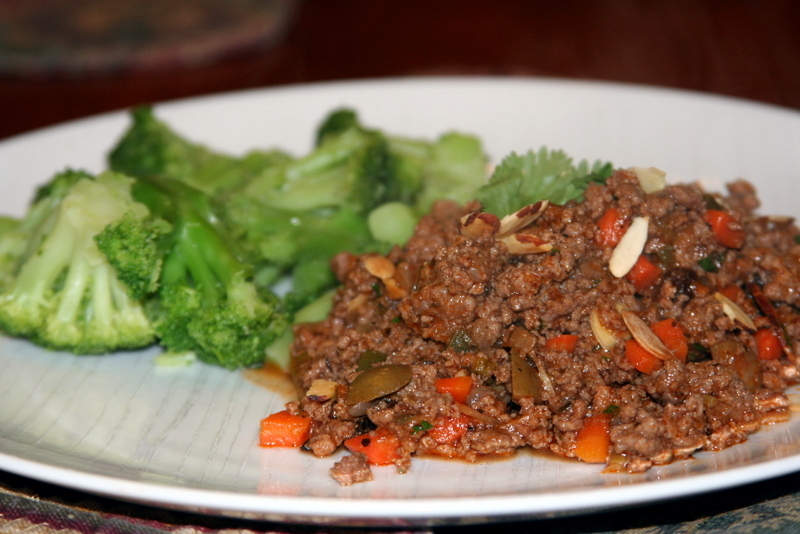 Picadillo is a Cuban dish that is easy to make and delicious to eat. It has a lot of different flavor components that come together in a savory-sweet way that I really like. Mine isn’t totally traditional because I’ve been craving smoky flavors lately so I added some smoked paprika. And typically this would be served with rice or inside an empanada, but you know how Paleo rolls – a nice pile of meat and a veggie side and you’re good to go! You could easily serve this over spaghetti squash or tossed with some quickly sautéed zoodles, and both those options would be delicious. I had it for lunch the next day piled on top of some garlicky green beans, which might have been my favorite way, and I also heated it up and then added it to a simple salad (lettuce, tomato, avocado, scallions). There are really endless options so if you’re looking for something to make when you’re doing your weekly cook-up, you might want to give this one a try. 1) Melt fat over medium-high heat in a large sauté pan. Add carrots, onion, bell pepper, 1/2 tsp. salt and sauté about 5-7 minutes, until beginning to soften. 2) Add ground beef and additional 1/2 tsp. salt, plus a few grinds of pepper, and cook until brown throughout, about 10 minutes. 3) Stir in tomato paste, garlic powder, thyme, oregano, and cinnamon. 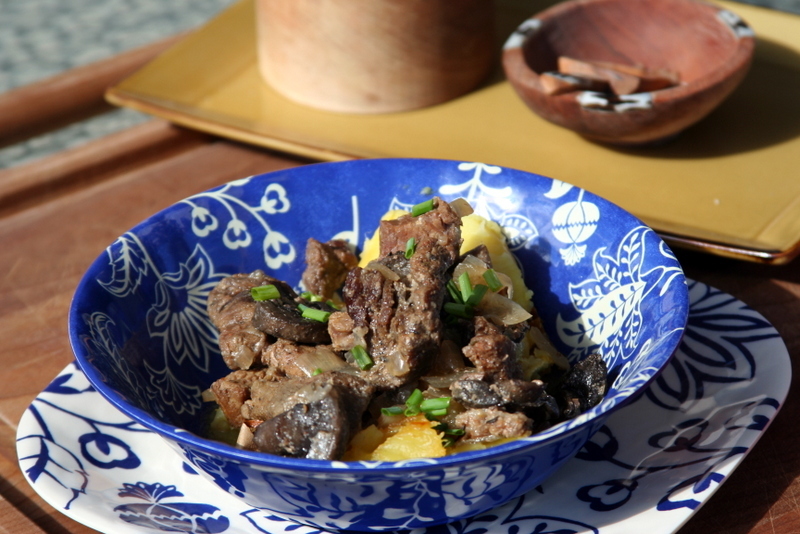 Cook until fragrant, about 30 seconds, then add broth, raisins, olives, and capers. Simmer over medium heat for about 15 minutes until most of the liquid is gone. 4) Add vinegar and cilantro, taste for seasoning and add any extra salt or pepper, top with toasted almonds and serve. 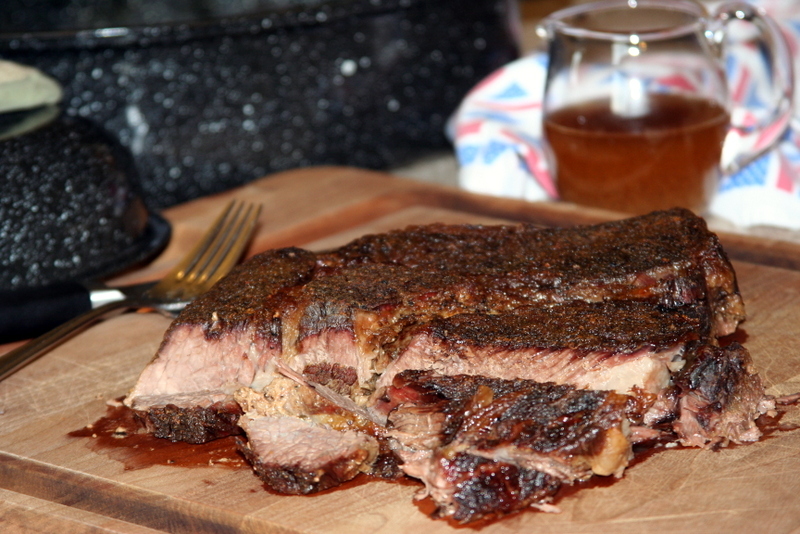 My son loves pot roast, brisket, and basically, all slow cooked beef. I love things that can be put in the oven and left for a while so that I can get other stuff done, including hang out with him. You know what else I like? Affordable cuts of meat. This is one of those basics that is great to have in your cooking repertoire because it’s super simple and is mostly hands-off. Depending on how many you’re feeding, you also generally end up with some leftovers. That’s a big deal in my house because I love having cooked protein around to make lunches a snap. A couple of things about pot roast. There are different cuts of meat with different names that you can use to make a pot roast; I used boneless chuck pot roast here but I use the same cooking method with beef brisket. The important thing to remember is that you need a tough cut of meat so that the long cooking time turns it into something tender and delicious. Here’s the other thing – A lot of pot roast recipes out there call for carrots and onions, wine or broth, maybe potatoes, etc. Sometimes I make mine like that too, but what I’ve found over time (and by dividing the meat and doing both ways to have a side-by-side comparison) is that my family prefers the meat separate and the veggies separate. That way they all have a chance to get this amazing caramelization and keep their individual flavors rather than stew together and get soft like beef stew veggies. The little bit of water I use is just to provide a cushion so that the juices can start accumulating into a flavorful broth without burning first. And one more thing…Do you see that black, lidded pot in the back of the photo? It’s not an expensive pot and I’m pretty sure you can find it at any supermarket, and it’s perfect for this. The lid fits tightly, things cook beautifully, and clean-up is a breeze. There are only a few more weeks until the weather gets warm so hurry and make this simple pot roast. You won’t regret it! 1 large boneless chuck pot roast, about 3 1/4 lbs. 1) Set oven to 275 degrees. Combine all the spices together in a small bowl. 2) Pour water into the bottom of a roasting pan with a tight fitting lid. 3) Sprinkle half of the spice mixture on one side of the meat and then pat and rub it in well. Place the meat spice-side down into the pot and cover the other side with the remainder of the spice mixture, patting and rubbing again. Make sure your meat is well coated. 4) Cover with the lid and place the meat into the oven. Let cook undisturbed for about 3 hours and then check to see if the desired tenderness has been reached. If not, replace the lid and allow to cook another 30 – 60 minutes. The roast in the photo cooked for 4 hours. 5) Remove the roast from the oven and allow to rest on a cutting board, lightly covered with foil, for 10 minutes. While the meat is resting, remove as much of the fat from the juices as possible using a fat separator or placing the juices in the fridge and allowing the fat to solidify slightly. Slice meat against the grain and serve with the meat juices and a bunch of roasted veggies. 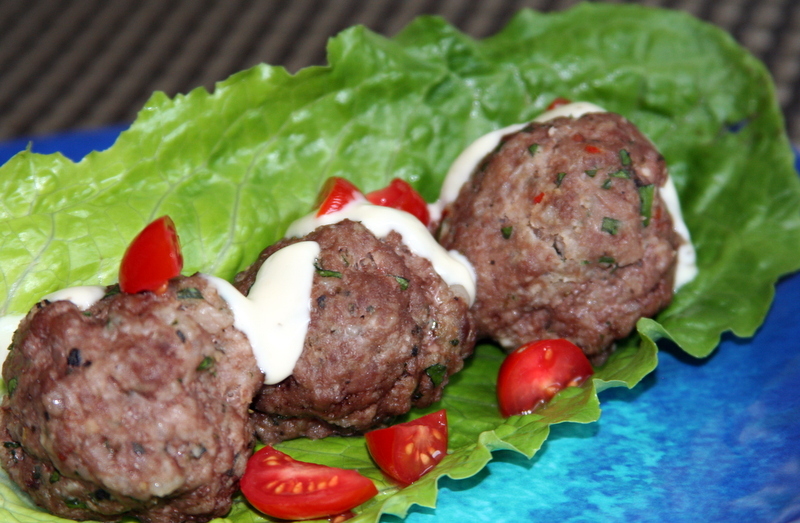 Meatballs are a Paleo girl’s (or guy’s!) best friend. You can make a bunch of these fairly quickly and then eat them for multiple meals or snacks throughout the week. One of the things that I’ve learned on my Paleo journey is that having prepared food in the fridge makes a world of difference. When you eat the Standard American Diet, if you’re hungry at a moments notice, you can grab a granola bar or yogurt and move on. Sometimes being Paleo means you have to be a little more creative and a little more flexible with how you look at food. I like to have extra protein in my fridge at all times, and meatballs are perfect for that! As a matter of fact, these meatballs started first as a dinner. I threw together a quick marinara sauce on the stove and plopped in about a dozen of the already cooked meatballs. I let them simmer for a bit to get comfortable together, and then we ate them on top of roasted spaghetti squash. The next day, they were my lunch and it looked more like the picture. Confession: After I took the picture, I chopped the meatballs up, added some more tomatoes, and spread them across three large lettuce leaves. More lettuce, more lunch. That’s how I like it. I hope you have fun with these and please share with me if you do something delicious with them! 1) Preheat oven to 425 degrees. Add all the ingredients to a large bowl and gently mix everything together. Hands work great for this because you can mix thoroughly but with a light touch. 2) Pinch off a small golf ball sized amount of meat. Gently roll the mixture in your hands to form a meatball about 1 1/2 in. across. Place on a baking sheet. Continue forming meatballs until the mixture is gone. 3) Place in the oven for about 23 minutes until cooked through. Use these meatballs for breakfast, lunch, dinner, and snacks! When you love to cook like I do and a friend mentions anything that even remotely sounds like a request, it is often the beginning of a mission. The other day, a dear friend of mine was talking about how busy she’s been and how nice if would be to come home some days to something warm that doesn’t take a lot of time or effort. On top of that, while it may not feel like it some days, soup season is starting to wind down and that makes me a little sad. I happen to love soups and stews year round, but my family doesn’t feel the same way about sitting down to a piping hot curry or chili in the middle of July, so I need to get my soup fix in fast. This soup does take a little prep, but you don’t have to do it all at once. In fact, I don’t even recommend it. Something I have started doing over the weekend is roasting a spaghetti squash. It takes a little while to roast and it’s easier to string it once it’s cool, so I just do the entire process when I’m not planning on using it. The whole batch gets put in a container in the fridge for whenever I need it, just like this soup. 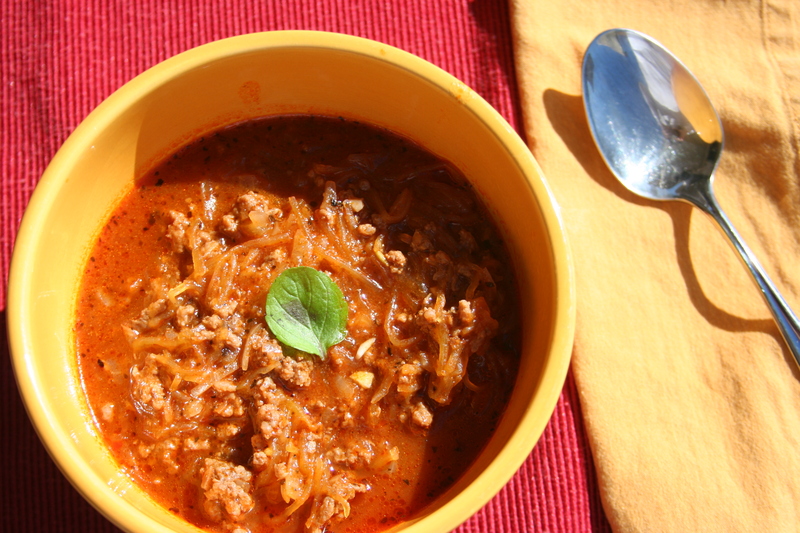 This soup is a twist on a big bowl of spaghetti. The spaghetti squash will be a bit crunchier than traditional noodles, but it still gives you that same fun feeling. It would be beautiful topped with some fresh basil or parsley or you could sprinkle some parmesan on the top if you’re into cheese. I found it just perfect with some fresh cracked pepper and a great big spoon! 1/2 large onion, chopped about 1 c.
1) Melt the coconut oil over medium-high heat and sauté the onions for about 4-5 minutes, until translucent. Add the beef and garlic and cook until browned, about 5-7 minutes. 2) Add all the spices, beef stock, water, and tomato sauce, stirring to combine. Bring to a boil and then turn the heat to low. Simmer covered for about 30 minutes. 3) Add the spaghetti squash, simmer for about 10 minutes more to bring all the flavors together, add additional salt and pepper to taste, and enjoy.